Story Development: Every story has three main stages – Beginning, Middle and End. Screenwriters call it a three-act formula: Set-up, Conflict and Resolution. Then he meets the Problem. This involves the antagonist (the bad guy). Immediately we have Conflict. This is the longest act, with the hero solving an immediate problem, then finding another one in his path – in many cases it’s the previous solution that causes the next stumbling block. Eventually the protagonist achieves his goal and we have resolution. Storyboards: A storyboard is a visual script designed to make it easier to for the director to "see" the shots before executing. It is used for movies, commercials and animation. Animatic: An animatic or story reel is made after the soundtrack is created, but before full animation begins. An animatic typically consists of pictures of the storyboard synchronized with the soundtrack. Model (Character) Sheet: A basic model sheet shows a character from all sides and gives the animator a clear idea of the character's structure and proportions. Consider a story you would like to tell. The underlying concept should be simple and straight forward and must happen in 1.5-3 minutes. Use a watch and act out the entire story. Make a list of People, Places and Things. Choose one from each column- mix and match. Spoof a well-known story or historical event. Look at photographs in magazines – ask questions about the characters and the environment – What are they doing there? – How did they get there? Watch people in a public place, expand the actions of two or more people into a simple story with a conflict. Think about a situation or event from your childhood. Write about an event from the point of view of a child. What makes you feel passionate or angry or sad? Make quick, rough sketches of your character(s), props, costumes, and background scene(s). Atom Films - check out a few animated shorts and see if you can find the Set-up, Conflict and Resolution. 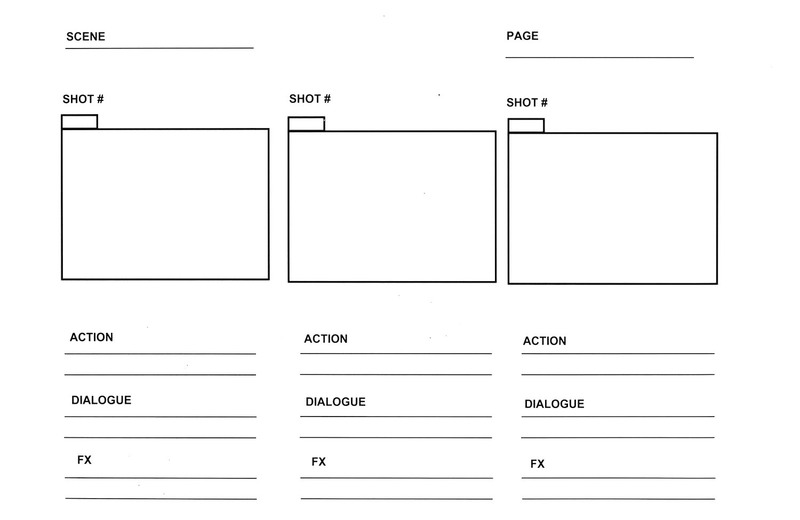 Start storyboarding your concept by printing out this storyboard template. Here you will rough out the pacing of the complete short by breaking down your story idea into a series of shots. Number each shot and determine how many panels will be needed to explain each shot. Coordinate your script with your rough storyboard panels. Indicate dialog, sound effects, camera direction and timing. What characters are in the frame, and how are they moving? What are the characters saying to each other, if anything or how are they interacting?